[SatNews] About 5,000 pounds of NASA science investigations and cargo are on their way to the International Space Station aboard SpaceX's Dragon spacecraft. Dragon will spend two days chasing the International Space Station, during which it will conduct a series of thruster firings to refine its path. Tuesday morning at 7:04 a.m. EDT, the Dragon spacecraft will catch up to the orbiting laboratory, and Expedition 41 Flight Engineer and European Space Agency Astronaut Alexander Gerst will use the station’s 57.7-foot robotic arm to reach out and capture it. NASA astronaut and flight engineer Reid Wiseman will work with Gerst as they operate from the station’s cupola. 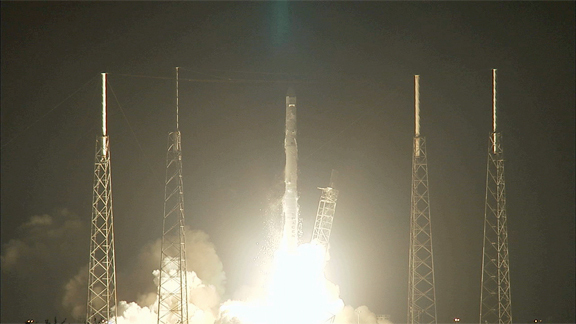 The cargo ship launched on the company's Falcon 9 rocket from Space Launch Complex-40 at Cape Canaveral Air Force Station in Florida at 1:52 a.m. EDT on Sunday, September 21st. The mission is the company's fourth cargo delivery flight to the space station through a $1.6 billion NASA Commercial Resupply Services contract. Dragon's cargo will support experiments to be conducted by the crews of space station Expeditions 41 and 42. One of the new Earth science investigations heading to the orbital laboratory is the International Space Station-Rapid Scatterometer. ISS-RapidScat monitors ocean winds from the vantage point of the space station. This space-based scatterometer is a remote sensing instrument that uses radar pulses reflected from the ocean's surface from different angles to calculate surface wind speed and direction. This information will be useful for weather forecasting and hurricane monitoring. Dragon is scheduled to be grappled at 7:04 a.m. on Tuesday, September 23rd, by Expedition 41 Flight Engineer Alexander Gerst of the European Space Agency, using the space station's robotic arm to take hold of the spacecraft. NASA's Reid Wiseman will support Gerst in a backup position. Dragon is scheduled to depart the space station in mid-October for a splashdown in the Pacific Ocean, west of Baja California, bringing from the space station almost 3,200 pounds of science, hardware and crew supplies. The space station is a convergence of science, technology and human innovation that demonstrates new technologies and makes research breakthroughs not possible on Earth. NASA recently awarded contracts to SpaceX and The Boeing Company to transport U.S. crews to and from the space station with the goal of certifying those transportation systems in 2017.